By choosing Kestrel Timber Frame you can benefit from our wealth of experience in timber frame structures. We can help you build quicker and more profitably as our reliable service helps meet our customers’ demands for more sustainable housing. Speed of construction is a major consideration weather you are a contractor or self-builder. Timber frames can be erected and made weathertight even in wet weather which often hinders the construction of brick and block buildings. Typically a timber frame home can be built quicker. Wood is a highly effective insulating material (even before any additional insulating materials are added). Therefore, timber frame homes exceed the increasingly strict building regulations in the UK. Timber frame homeowners will usually benefit from a reduced heating bill. Timber Frame party walls provide outstanding sound insulation - improving domestic comfort. In an acoustics study the BRE stated that "if all dwellings has sound insulation as good as that measured in the party wall of timber frame dwellings, the problem of noise from neighbours would be greatly reduced"
Timber frame is highly flexible in terms of design and is widely compatible with any type of cladding. Timber frame can be used for any application from bespoke houses to churches, leisure centres to hotels and many other structures. Timber frame structures are high durable and comparatively last just as long as other construction types. According to the Timber Frame Association, there are two Norwegian churches which are over 1,000 years old and 200 years old in the UK - both were built from the same type of wood employed today. Sourced from managed forests, our wood is sustainable, which can help contractors and developers meet Government sustainability guidelines and regulations. Additionally, use of pulped recycled newspaper as insulation material further improves the green credentials with no HCF or CFC emissions and is manufactured using substantially less energy than alternative insulating materials. The sustainable nature of timber makes timber frame construction one of the most sustainable building methods available. 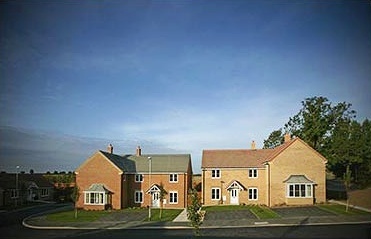 In April 2007, the government introduced the Code For Sustainable Homes (CSH). Since May 2008, all new homes have to be rated for sustainability based on energy use, carbon emissions, water, materials, waste, health and other aspects of environmental impact. A timber frame home designed and built by Kestrel Timber Frame can help you achieve a higher CSH rating, while helping to protect the environment for future generations. Timber frame has the lowest carbon cost of any commercial building material, every completed home saves approximately 4 tonnes of CO2. Using timber frame along with renewable technologies is the most economical way to achieve the Code for Sustainable Homes. Kestrel Timber Frame sources timber from sustainable managed forests. Our commitment to renewable resources starts with acquiring timber from sustainable, managed forests. We take every effort to ensure we reduce our carbon footprint by minimising waste and by being energy efficient in manufacture and transport processes. At Kestrel Timber Frame, construction health and safety is always a main priority – with the safety of staff and associated trades with us on our construction site being paramount. We create site specific risk assessments and method statements for every contract undertaken to enable a site safe for construction. You can be sure that when you’re working in partnership with us; our health and safety approach and practices meet the necessary legal criteria for site construction safety. Kestrel Timber Frame is a member of the Timber Research and Development Association (TRADA) to ensure that we keep up to date with the latest in building regulations and building codes keeping us at the forefront of timber frame construction design and safety. The purpose of accreditation for Kestrel Timber Frame is to ensure focus on continual improvement and provide standards of excellence to all our clients – from self-build to local, regional and national builders, as well as local, regional and national construction companies. Kestrel Timber Frame is a member of the PEFC (Programme for the Endorsement of Forest Certification) Council. PEFC is the world’s largest forest certification system, whose credible standards seek to transform the way forests are managed globally – and locally – to ensure that we can all enjoy the environmental, social and economic benefits that forests offer. Kestrel Timber Frame is proud to be a member of TRADA, a leading global certification body accredited by the United Kingdom Accreditation Service. TRADA was established to develop quality assurance schemes in the construction industry.